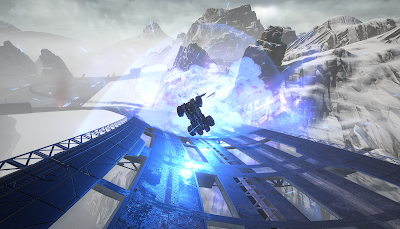 I recently had the chance to visit UK Interactive Entertainment for a hands-on preview with Caged Element and Wired Productions upcoming combat racer, GRIP. Promising intense combat and blistering speed, is GRIP a worthy successor to the old-school Rollcage series or simply just another cash in? For those of you new to the genre, combat racers used to be pretty big on the gaming scene. With titles such as Carmageddon, Twisted Metal and Wipeout, this somewhat niché genre has been known to cover a multitude of playstyles. 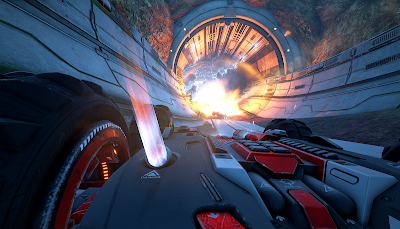 Some titles focus more on the combat with others placing more emphasis on the racing, but generally, a solid mixture of both is needed for creating the best of the genre, and Rollcage is one such game. Released in 1999, the first Rollcage could be played on both PC and the PlayStation 1. Its identity was unique enough to set it apart from other top racers at the time and compared to Wipeout, Rollcage offered a lot more freedom on the track. With the ability to drive up the side of walls, race along ceilings and even continue driving with an overturned car, you were in control of an almost unstoppable speed machine, collecting pick-ups (think Mario Kart) and blasting your opponents out of the way as you raced to the finish in this gravity defying combat racer. Since then, several studios have tried to revive the genre, with Sony being the only company to really keep it afloat with the Wipeout series. So, I guess it was about time another company stepped up and that's exactly what Caged Element have done with GRIP. As a spiritual successor to the old Rollcage series, Caged Element have openly said that Rollcage was an old favourite of theirs and after expressing their passion for the series, they wanted more, and so set out to develop their very own version of the title they played and loved nearly twenty years ago. As a fan of the original series myself, I was eager to get my hands on this, so when I received an invitation to attend the preview event for GRIP, I jumped at the chance. Immediately upon my arrival (and not just from the almost identical in-game HUD) I could see how closely this resembled Rollcage, so much so that if licensing wasn't an issue, the guys at Caged Element could call this Rollcage 2018 and I wouldn't even bat an eyelid. For an indie game, GRIP is an incredibly stunning title. The attention to detail is so superb you wouldn't even know it was made on a much smaller budget than the AAA titles we see so frequently today. It's still in early access, so not everything is final, but the visuals are almost there. 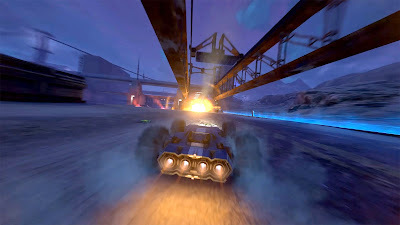 Vehicles can travel up to speeds of 767mph, so naturally the devs have focused on making GRIP feel as fast as possible, but with a little more work such as heavier motion blur, I believe it can feel even faster without needing to increase actual vehicle speed, side-stepping the issue of moving so absurdly fast you can no longer control your vehicle. That being said, GRIP has multiple difficulties ranging from Easy to Nightmare, along with numerous settings and several speed tiers for your vehicles. As I found out during the demonstration, switching the vehicle class up to the highest (Wild) isn't always the best choice and at times, is simply too fast for some of the current tracks. Unlike Burnout though, you really do need to brake around corners in GRIP. My experience was based primarily on GRIPs multiplayer, though I got to try out every mode minus Story and Time Trial. It's also worth noting GRIP currently supports two player split-screen (with eventual support for four players) and will support up to 10 players online, along with leaderboards, tournaments, regular patches, free updates and paid DLC. The PC version also supports LAN play and Wired Productions' Product Manager (Alasdair Hibberd) put emphasis on the fact all paid DLC will be purely cosmetic. The version I played was for PS4, but right now, early access is only available to the public on Windows. Now, I mentioned the paid DLC will be purely cosmetic and that's because there are a number of ways you can customise the 15 armoured cars within the game. Each vehicle has its own pros and cons, with some having a faster acceleration, others a better top speed and all of the handling statistics you'd expect from an arcade racer. You can then modify these vehicles with a number of different rims/alloys, tyres, vehicle skins/liveries, paint jobs and decals. I also made it a point to say I really love being able to customise something enough so that others can easily recognise it as my own. I like to express myself through creative means and think it would be amazing to be instantly recognised on the track because of my vehicles unique appearance. This prompted me to ask about current and future customisation not currently in the game. Alasdair then told me full paint job customisation on the level of Forza wouldn't be featured because the devs didn't want people racing around with custom created Swastikas or sexual organs plastered all over their vehicles (understandable), so have limited the number of decals you can have on any vehicle to just one, but have allowed us to customise almost everything else. At this point in time, tyres can be lightened to white or darkened to black, but coloured tyres aren't currently planned for the game. Though, I was told if the community want it, they don't see why they can't add it in a future update. Plus, there are plans in the works to potentially allow you to have your own custom boost colours (similar to Rocket League), but this is something that'll be implemented at a later date if it even comes to fruition. Caged Element have really listened to fans on this one and to keep gamers playing for years to come, have decided to increase the level caps periodically with the free future updates they have planned. Interestingly, they said they're closely following the community and will continue to add content if they see enough requests for something. They also said that bacon has weirdly enough become the communities source of karma/currency and as such, have planned a bacon skin for vehicle customisation. Another Journalist alongside me asked if there would be a platform for fans to create their own levels in the form of mods or via a community created content section, though Alasdair said there were no plans for that at this stage. Judging by what's been said however, perhaps that's not entirely out of the question depending on future updates, public demand and how well GRIP does financially. A sphere enveloped by lush alien jungle that is very much alive. The GRIP league drop their materials and crew through the thick canopy of trees to lay as much track as they can before the planet starts to take over again. The world was once peppered with research facilities, but most have subdued to the plant life's lust for reclaiming its territory. Essentially a floating metropolis, this planet is one big city, devoid of landscape, vegetation or wild life. What it lacks in natural colour, it makes up for with its Red Sun district and flashy advertisements. Orbital Prime is mostly a seedy, corrupt place full of outcasts and criminals, and would make the perfect place to drop a race if it weren't for the affluent oligarchs running the show with the local militia rewarded well to assert their will. Once a highly utilised military installation that strategically borders an opposing planet, this cold, barren landscape became just too hostile for habitation. Knives of ice jut out from the planet's hardened crust, and brutal ice storms mercilessly ravage the surface without end. Authorities rarely attempt to shut down the races here, and for good reason. What we would call the very epitome of blistering desert, this arid but resource rich location quickly showed itself to be ideal for GRIP's show-downs. With its massive surface size, access to an abundance of fuel and the ability to drop track sections in and out with ease, Jahtra quickly became a prime racing location. Work your way up to the top of the GRIP Pirate Racing League, unlocking new tracks, cars and upgrades for your ride. Play a single race on any track you've unlocked, with any car you've unlocked, along with your preferred custom track settings, including time of day, weather, weapons used and other options. Record your fastest time and race against your ghost, or race the ghost car of anyone else who have uploaded their fastest lap times to the in-game leaderboards. Get dropped into an arena with multiple opponents, as you all scramble to the best weapons you can find in order to eliminate your foes. Last car standing wins, but remember to stay away from the flaming cars before they explode! Similar to Scramble Mode from Rollcage: Stage 2, this mode has you navigating a point-to-point track, avoiding obstacles, exposing hidden paths and hitting big jumps, while trying to get the best time on the track. Of these modes, I had the chance to play Arcade, Arena and Carkour. Carkour is just like parkour, only in Batman Tumbler sized death machines and just like arcade mode, the courses here are labeled by difficulty. Even the easy levels can be hard, but just out of curiosity I had a go on one of the Nightmare rated courses and ended up on a loop-the-loop track with next to no run up. At the end of it is a ramp and a huge gap to clear before you can even continue with the rest of the course. I came close several times, but didn't even make it to the other platform. This was a lot of fun, but could just as easily turn into a rage induced sulk-fest. This mode requires a lot of patience. Racing through Arcade Mode, I had the chance to try out a number of different tracks on varying difficulty settings and let me just say, Nightmare really does step things up in all areas of the game. Gone are many of the barriers, meaning a single slip up will send you out of bounds, easily costing you that sweet first place spot and sending you right to the back of the pack. Thankfully, holding the touchpad resets you back to the track manually if you get stuck and with the arsenal of weapons available to you, the ability to shield yourself from incoming attacks and with how helpful the boost pick-ups are, once you get the hang of things, you have a pretty good chance of fighting your way back to the top spot again - It just takes skill. You can also jump from ceiling to floor (and vice versa) by simply pressing X, but the most effective way of dealing with your opponents is to remove them from the race altogether. For this, you'll want to familiarise yourself with the many weapons scattered across GRIPs 22 different circuits. Weapons include mounted Machine Guns, Missiles, deployable Land Mines and even a Railgun that's currently in the works, promising to be powerful enough to send your opponents flying. Lastly, Arena Mode has the potential to be fun, but of the entire session, this was the mode that interested me the least. The issue I found was it can take you a while to find your opponents due to track size and the environment itself blocking a lot of your vision. I ended up driving around to have a better look at the arena, found some ramps to have some fun with and at one point was even driving upside-down across the map ceiling barrier. There's fun to be had, but I felt this was the weakest mode on offer. Overall, I had a lot of fun with this and though GRIP is currently incomplete, even in this early access stage there's a great deal of polished content here. The folk at Caged Element have done a fantastic job at re-capturing the spirit of Rollcage and I'm looking forward to getting my hands on the full title. For more information, be sure to check out the official website for GRIP here. GRIP is scheduled for release later this year on PS4/PS4 Pro, Xbox One/Xbox One X, Nintendo Switch and PC (via Steam) November 6th.